On Wednesday August 28th, Oakland Rising opened its doors to donors and friends in celebration of the organization’s success and to thank them for continued support. 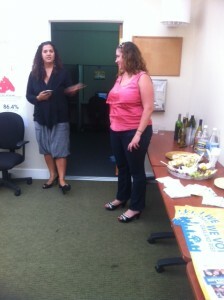 Participants were able to get a tour of the collaborative’s new office in downtown Oakland (a block away from civic center), get results from their work in past elections and hear from the employees who have learned how to be more engaged in the political process by working with Oakland Rising. Oakland Rising’s Esperanza Tervalon-Daumont and Jessamyn Sabbag greet guests. Oakland Rising, a partnership between East Bay Alliance for Sustainable Economy (EBASE), The Asian Pacific Environmental Network (APEN), Causa Justa::Just Cause, The Ella Baker Center for Human Rights and Mujeres Unidas Y Activas (MUA), works to mobilize voters to be active participants in decisions being made that effect their community. “Before I started working for Oakland Rising, I never voted.” Oakland Rising Employee. Oakland Rising hires local residents to call registered voters and inform them of local initiatives on the ballot. The calls are followed by with visits to their home reminding them to vote on election day. Some OR employees were apathetic about voting themselves, but after spending time learning about how local initiatives impacts their lives and advocating on behalf of their community, they gain a new appreciation about the civic process. Full Disclosure: I participated in get out the vote door knocking session with Oakland Rising in East and West Oakland during the 2012 election and for me it was an eye-opening experience. I was able to talk to and get to know flatland neighbors and learning issues that they care about. If you get a chance, I highly recommend volunteering. So far, the multiracial and multilingual organization was able to reach 47, 426 Oakland voters (most of them in the flatlands). Oakland Rising’s voter outreach efforts were instrumental in passing California Proposition 30 a progressive sales tax passed in 2012 to fund education and increasing local resident access to jobs at the Oakland Army Base. Art of Activism Documentary – Esperanza Tervalon-Daumont from The Redford Center on Vimeo. 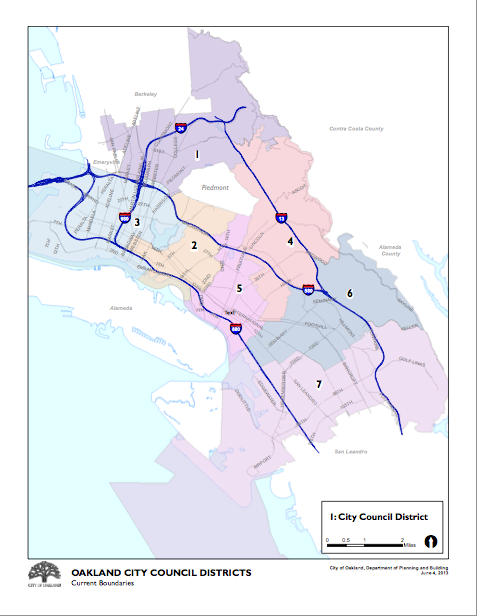 Oakland Council regions organized by equal numbers or socio-economic characteristics? Advocating for voter participation that reflects the surrounding communities. As part of that effort, Oakland Rising is participating in an initiative called Oakland Votes, in collaboration with the League of Women Voters and Urban Strategies to inform local residents about Oakland re –drawing City Council district lines. Every 10 years, Oakland divides council districts to make sure there are an equal number of voters in each region. According to the 2010 census, Districts 1, 2, 3 and 5 need to be adjusted because District 1 and 3 are ‘overpopulated’ and 2 and 5 are under-populated. There is discussion around the idea of dividing the districts not only by population but by similar socio-economic interests. Proponents of this strategy say that it has the potential to make sure council representatives truly reflect the needs of the majority of that community. The city of Oakland is looking for community input into redistricting process. In July city of Oakland consultants held community workshops requesting residents to draw their own city council maps using an online application. (See storify of workshop I attended here). Thursday, September 5, 6:30 – 8:30 p.m. Caesar Chavez Education Center, 2825 International Boulevard (District 5) Interpretation in Spanish will be provided. Oakland Rising and Oakland Votes will be having a special forum WEDNESDAY, SEPT. 18, 6-8pm, HUB Oakland, 1423 Broadway. Participants will learn how redistricting will impact education (city council and OUSD districts are similar), public safety and other city services. Oakland Votes will also share maps that have already been submitted online and provide participants with an opportunity to draw their own maps on paper. Has Oakland Rising been to visit you about local issues? What concerns do you have about the Oakland Redistricting process? SHARE!